Ontech Systems provides efficient, reliable IT support services to West Bend based businesses as well as the Greater Milwaukee area. Searching for Computer Consulting & Support in West Bend, WI? With a client retention rate of 98% over the last 10 years, Ontech Systems has delivered comprehensive IT support in West Bend to small and medium sized businesses. All businesses need IT support; from law firms, to health care agencies and small businesses – but not everyone has the staff and budget to employ an in-house IT staff. 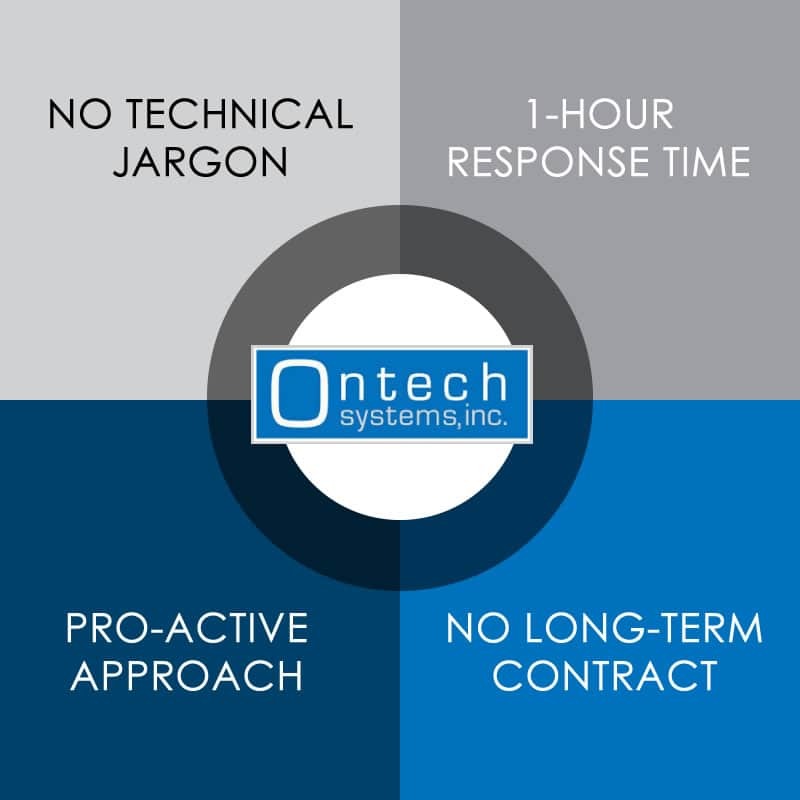 Is Ontech Systems Right for your Business? Whether you need new solutions such as network hardware/software or ongoing IT support (on-site and/or remote support, continued application development, troubleshooting/maintenance), Ontech can assist with all your computer support and networking needs – as your primary West Bend IT support provider. Why Choose Ontech Over other West Bend IT Support Providers? Our techs avoid technical jargon, speaking plainly and clearly, so you’ll never be left in the dark. We want to resolve your technical issues as quickly as possible, but we also want you to understand what we are doing and why we are doing it. We’re incredibly responsive. Time is money in the business world, and we want to make sure you have plenty of both. During regular business hours, we will respond to your phone call or email within an hour of your request. We are a proactive service. We don’t want to offer you a ‘quick fix’ and walk away. Our technicians work with you to integrate your overall goals and long-term growth potential into our support plan. We will make sure your system adapts as technology evolves and your technology needs change over time. We can help you recover from a major data loss and also implement a plan to avoid it happening in the first place. No long term contracts necessary. Unlike many IT companies who require you to sign a contract, with our 10-year 98% client retention rate, we know you’ll want to continue to do business with us because you want to – not because you have to. As a first step, Ontech offers a free, no-obligation Network Discovery, where we’ll evaluate your existing network and offer ideas to improve the productivity and efficiency of your business. Our technician will audit your existing network and equipment and explain their findings to you in an easy- to-understand Q&A session. What happens if our system fails? How susceptible are we to viruses? Is our hardware up to date and reliable? How can we prevent so much SPAM from flooding into our inboxes? How about a No-Obligation, Risk Free, Network Discovery? Call or email Ontech Systems today at (262) 522-8560 for responsive, comprehensive technical solutions and IT support in West Bend, WI. Request your no-obligation, free network discovery today!